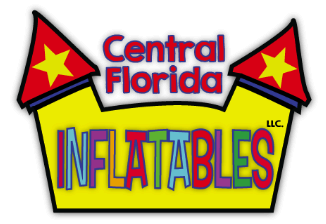 A: Central Florida Inflatables provides free delivery to all locations within 25 miles of Central Florida Inflatables corporate office in Maitland, FL. Delivery fee for locations outside of the 25 mile radius is $25 up to $50 depending on the distance and equipment rented. Set up is included in the price. A: That depends on how many rentals we have that day. Generally, we arrive 1-3 hours before the rental time begins. If we have a lot of rentals that day, we may need to set up as early as 4 hours in advance. If this is the case, we will ahead to confirm that someone will be at the party location. A: No. The jump should be clean when you get it. Central Florida Inflatables cleans and disinfects after every rental. A: Yes. A blower keeps air in the jump unit the entire time. Once unplugged they deflate. That's why we require an outlet within 50%uFFFD of the unit or a generator. Longer cords can pop your circuit breaker so we bring our own heavy duty cords. A: Cash, Check, or Credit Cards. If paying by cash, please have exact change as our drivers do not carry cash. A: Yes all orders require a $50 Credit Card deposit. * The are fully refundable if you cancel your order at least 8 days prior to your rental date. If you cancel between 2-7 days prior to your rental you will be given a rain check that is good for 1 year. *if using a different form of payment or you do not wish to provide credit card information, contact Chris Goodwin at 407-782-6245 or chris@mycentralfloridainflatables.com to work out another arrangement.